Learn how to pick faster. 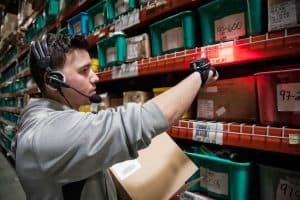 Here are some order picking strategies that will maximize picking efficiency in your warehouse’s pick lines, systems and processes. A scan of slot ID barcode labels and product UPC codes. Blind entry of the quantity picked. Placing slow-moving items on side aisles. Enter them only when needed. Pick from both sides of the aisle and be sure to use small pick facings. Batch pick, by picking multiple small orders in a single trip. Create an optimized replenishment system to ensure that any given selector will avoid dealing with an empty pick slot that needs to be filled. Also be sure the is no order segregation that cause wait timed for missing items prior to shipping. If possible, generate pick lists that show only items that are in stock at any given pick slot. Don’t waste time by having pickers correct inventory data, when missing items are discovered. Only touch each picked piece once. The picking process should be designed so that accuracy is ensured, and further repacking, quality control checking or shipping checking is never needed. A picked unit should go into a truck after being touched by the original picker only. Generate a short pick line that contain A-list items, so that 10 percent of SKUs that satisfy half of all orders. This order picking strategy results in 50 percent of all your picks through 10 percent of the pick area. Next identify 20 percent the items that satisfy 30 percent of orders. Slot these off the short pick line. As a result a majority of all orders now require travel past only 15 to 20 percent all pick slots in your warehouse. All orders slow to the speed of the slowest picker in pass-along picking. Totes are passed along a conveyor line from picker to picker, so switch from conveyor picking to individual cart picks, if possible. Use this tactic to increase pick rates by 30 to 200 percent. Employ focused management support of workers that are responsible for picking accuracy and efficiency. This top-down tactic is the most effective way to improve a distribution design. Staff will sense immediately if managers are not committed optimization and productivity. Demonstrate this manager driven commitment, so that the whole staff understands an overall commitment to excellence. Warehouse productivity is undermined as customer requirements change. Your staff is your first line of defense against inefficiencies, so invest in training around productivity and accuracy improvement. Also, introduce management-supported quality circles, because these regular meetings can identify problems and reveal solutions. These practices will result in ongoing improvement. Need more order picking strategies? We hope this warehouse picking guide provides valuable strategies for efficiency and optimization. Implementing the ideas will make it possible to learn how to pick faster. We hope it has given you some great ideas. To maximize efficiency, contact a warehouse optimization expert to design and plan for your specific operation. If you would like a referral, contact us and we will connect you with a warehouse consultant near you for a free 30-minute call. This book may help in your efforts to learn how to pick faster in a warehouse, so read it to build your knowledge around order picking strategies. It is affordable, and available from Amazon.